I love my life and I love that most things I do involve my children. I even enjoy eating out with them. However, it is nice once in a while to have a completely grown up night out. Last night was one of those nights and it was a really good one. I headed up to London early evening on the train and had hour to shop on Oxford Street. I managed to find the perfect black maxi skirt in H&M which I have been searching for for months. I felt good about myself too which doesn't always happen. I thought I really suited my outfit and someone with a camera wanted to take my photo. They asked if I lived in London but as I didn't they didn't need me. I am pleased to be honest as I wouldn't have wanted my picture taken. But I shall tell myself it was for a very cool fashion magazine and not an article on ugly Londoners! 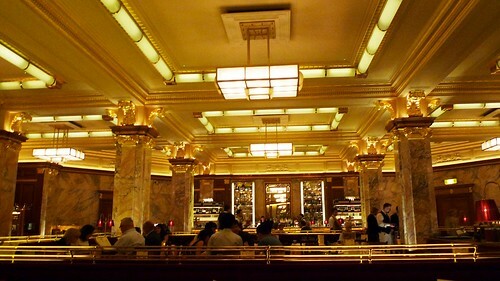 After the shopping I went to meet my friends for dinner at a gorgeous restaurant called Brasserie Zedel. I didn't take any photos (apart from a couple of snaps of my dinner and a toilet selfie!) so I found this lovely one that doesn't show the whole restaurant but it captures the atmosphere I think. And shows how beautiful the place is. We drank cocktails and wine, ate three courses of delicious food. We laughed and chatted and I got presents as it was a belated birthday bash for me and another friend. I went home smiling after such a perfect night out. I hope you all had a fabulous weekend too. I just love photography! I love taking photos and adore looking through other people's work just as much. I am equally interested in the work of professionals and complete amateurs. In this blog I want to showcase some of my own work which I am particularly proud of and also write about some of the photos I have come across which I find stunning.